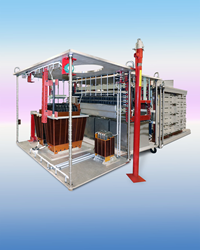 Diversified Technologies, Inc. (DTI) has introduced a new, all solid-state high power pulse modulator for driving 70 MW-class klystrons at an average beam power of 250 kW with short pulses. DTI PowerMod™ Solid-State Klystron Modulators are designed for driving 70 MW-class klystrons at an average beam power of 250 kW. Energized by standard DTI switching power supplies providing 40 kV, 250 kW average power, DTI PowerMod™ Solid-State Klystron Modulators offer a MTBF of over 100 K hours. DTI PowerMod™ Solid-State Klystron Modulators Diversified Technologies, Inc. (DTI) has introduced a new, all solid-state high power pulse modulator for driving 70 MW-class klystrons at an average beam power of 250 kW with short pulses. DTI PowerMod™ Solid-State Klystron Modulators are designed for driving 70 MW-class klystrons at an average beam power of 250 kW and also provide 450 kV, 545 A cathode pulses with a 3.0 µs flattop better than ±0.02%. They incorporate passive circuitry with the customer’s klystron mounted directly on the oil-filled modulator tank which contains the pulse circuitry for advanced accelerator applications and is split in half for ease of service. Energized by standard DTI switching power supplies providing 40 kV, 250 kW average power, DTI PowerMod™ Solid-State Klystron Modulators offer a MTBF of over 100 K hours. This reliability is enabled by DTI’s high voltage opening switch technology which minimizes stress in the event of a fault. An ideal building block for particle accelerators, DTI has delivered the first of three Klystron Modulators for CLARA at Daresbury Laboratories, UK. DTI PowerMod™ Solid-State Klystron Modulators are priced from $1,500,000.00 each. Price quotations are available upon request.